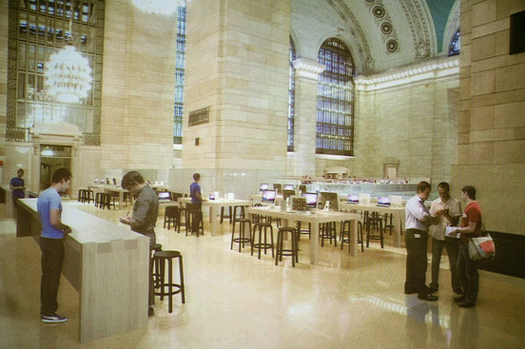 A rendering of the proposed Apple store at Grand Central Terminal. I wrote yesterday about how Pete Cashmore was in Grand Central yesterday and took a picture of what an Apple store might look like inside the Grand Central Station. At the time, it was only expected that a bid would be approved for the Apple store to be in GC. 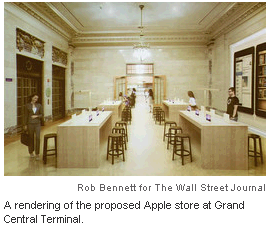 But it’s now official – Apple has won the bid to build their Apple Store inside of Grand Central in New York City. The store will be a whopping 23,000 square feet which will make it the world’s largest Apple store. New York City’s financial board will approve the 10 year lease to Apple sometime today. What’s interesting is that Apple delivered the bid for the new store to the Metropolitan Transit Authority in a linen-lined box, symbolizing an expensive gift was being sent. And funnier still, the blueprints for the new store are set to arrive on a velvet pillow. According to PCWorld, the lease for the new Apple store will cost Apple $800,000 a year for the first ten years, which is more than half a million dollars a year more than the space’s current owners. After the first ten years, Apple’s rent is expected to jump to more than a million dollars a year. Not cheap by any means. But on the other hand, imagine the amount of people that will be through the store shopping, especially when Apple has a new iPhone or iPad coming to market – when that happens, it will be chaos inside the GC.